JEFFERSON, NC — The Ashe County Sheriff is investigating three county employees after they attempted to access his text messages in the course of fulfilling a public records request from WBTV. In April, WBTV requested all written communication—including text messages and emails—sent and received by Sheriff Terry Buchanan and the county commissioners. The request was the subject of a nearly ten-minute rant by Buchanan at a commissioners meeting in mid-April, weeks after the request was submitted. The North Carolina Public Records Act makes nearly all records created by government officials and employees—which can be paper, electronic or another form—open to the public for inspection. “The public records and public information compiled by the agencies of North Carolina government or its subdivisions are the property of the people,” the statute reads. In his April speech before the commissioners, Buchanan acknowledged that he was subject to the public records act as sheriff. But WBTV has learned Buchanan’s office is investigating three county employees who attempted to retrieve Buchanan’s text message and provide them to WBTV in response to the station’s request. Disclosure of the sheriff’s office investigation was made Monday afternoon by Ann Clark, who serves as the public records custodian and clerk to the board for the Ashe County Board of Commissioners. Clark was responding to a question from an attorney representing WBTV in its ongoing public records request about why the county produced text messages from the county commissioners but not from Buchanan. 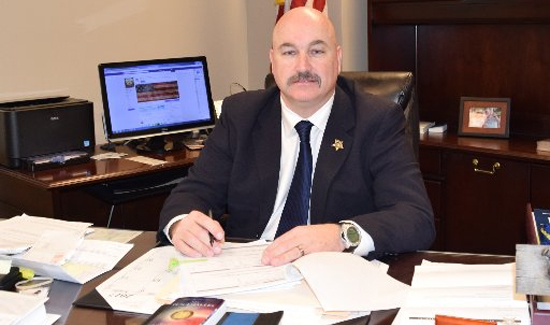 “I, along with two employees in our IT Department, are currently under criminal or administrative investigation by the Sheriff regarding work to obtain his text messages in response to the public records request by Nick Ochsner, therefore I do not believe that I am at liberty to answer this question,” Clark said in her email. Ashe County Sheriff’s Office Chief Deputy Rick Clayton confirmed an investigation in a phone call Monday afternoon but refused to provide the violation or possible violation of the law being investigated, as required by the Public Records Act. “It was an administrative investigation that could still potentially be ongoing so there’s not any information at this point,” Clayton said. Clayton refused to provide any information about the investigation even after a reporter cited to him the specific section of the law that required law enforcement agencies to make public what violation or potential violation of the law they are investigating.